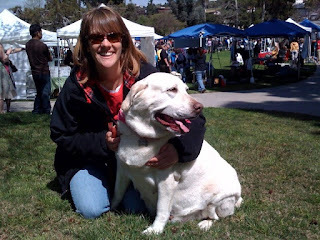 Allie has been looking for a good, adoptable dog from the local Labrador rescue organization for the past few months. Well today we finally found "the one". We went to a dog festival "Paws in the Park" in Solana Beach today as she had heard that a certain pup was going to be present. Her name (at the moment at least) is Pebbles. 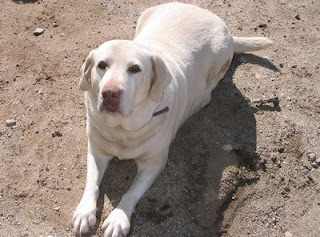 She's about 4-5 years old, an almost-white yellow Lab female. 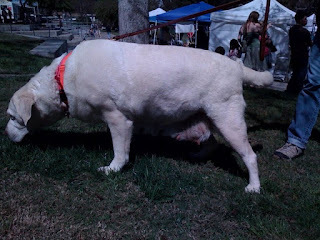 And probably the fattest Lab I have ever seen. She came to the rescue from a breeder and pushed out some puppies over the years. In fact, relatively recently as she's pretty droopy on her underside. Weighing in at a whopping 125, our first goal is to get her weight down to about 100 or so. Then down even further if possible. She's on a prescription weight-loss dog food (can't wait to find out how much that costs) and with many walks planned by Allie, she should do alright. 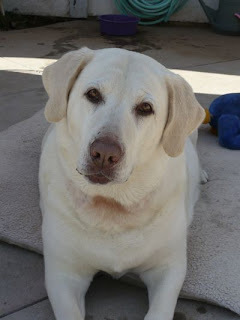 She's a pretty mellow girl, reminding us a lot of the last Lab we rescued from a breeder - Nessie (R.I.P.). Her foster "parents" state that she's only barked once, loves tennis balls and swimming and is great around kids. She seemed pretty nice today even though there were hundreds of distracting dogs around. Allie will pick her up sometime later in the week. It'll be great to have a doggie around the house again. Oh, and name - right now we're leaning towards Juno. In Roman mythology Juno is protector and special counselor of the state. Also the sister (and oddly also the wife) to Jupiter.